The Bio-technology program will tackle core subjects to ensure that they receive a solid grounding in fundamentals. Students will then specialize in the final year, making their choice from a wide range of options and research projects. Our biotechnology courses contain topics covering all aspects of the applied biotechnology industry, such as intellectual property and patents, commercializing technology etc. To produce higher caliber Bio-technologists to attain new heights in science and technology as per industrial needs and to provide leaders in the field of Biotechnology. To progress the department to attain center of excellence in science and technologies by providing best Undergraduate, Postgraduate, Doctoral programs and R&D activities within a decade. 3 PEO 3 Contribute towards technological development through academic research and industrial practices. 4 PEO 4 To produce research oriented Biotechnology graduates who will be employable in academic/Industry sponsored research and also who will be pursuing higher studies. 5 PEO 5 Ability to get employment in biotechnology and related industry and also to set up an industry. PSO1: To produce graduates as an outstanding researchers or eminent scientist in the field of biotechnology and to generate unique products for social need with concern ethical statute. PSO2: To sort the students to be an efficient entrepreneur to twitch biotechnology companies and industries. PSO3: To uplift the graduate’s more specifically in to research-oriented Biotechnologist and will be employable in academic/Industry sponsored research and also who will be pursuing higher research studies. Faculty are dynamically involved in guiding students apart from their regular curriculum teaching, and constantly pursuing extramural funding from national and international funding resources such as the DST, DBT, ICMR, DRDO, TNSCST and other major funding agency. Dr. P. Vasantha-Srinivasan, M.Sc., Ph.D., PDF. Dr. K. Amala, M.Sc., M.Phil., Ph.D., Assistant Professor Specialization: Ethno-pharmacology, Botany. Joint collaborations with S. Senthil-Nathan, ManonmaniamSundaranar University for collaborative research and 3 international journals has been published. Vasantha-Srinivasan et al. (2018) A novel herbal product based on Piper betle and Sphaeranthusindicus essential oils: Toxicity, repellent activity and impact on detoxifying enzymes GST and CYP450 of Aedesaegypti Liston (Diptera: Culicidae). J. Asia Pac. Entomol. 21, 1466-1472 (Impact Factor 0.980). Vasantha-Srinivasan et al. (2019) Aspergillus flavus (Link) toxins reduces the fitness of dengue vector Aedesaegypti (Linn.) and their non-target toxicity against aquatic predator. Microb. Pathogen. 128, 281-287 (Impact Factor: 2.08). Ponsankar, A., Senthil-Nathan, S. Vasantha-Srinivasan et al. Toxicity and developmental effect of cucurbitacin E from Citrulluscolocynthis L. (Cucurbitales: Cucurbitaceae) against Spodopteralitura Fab. and a non-target earthworm EiseniafetidaSavigny. Environ SciPollut Res (2019). https://doi.org/10.1007/s11356-019-04438-1 (Impact Factor: 2.38). Insect Toxicology laboratory was established with the funding supported under the sanctioned project from DST-ECRA (Early career research award DST ECR/2018/000552). To produce higher caliber Biotechnologists to attain new heights in science and technology as per industrial needs and to provide leaders in the field of Biotechnology. To inculcate entrepreneurship among the students so as to start their own ventures in the field of biotechnology. The Biotechnology program will tackle core subjects to ensure that they receive a solid grounding in fundamentals. Students will then specialize in the final year, making their choice from a wide range of options and research projects. Our biotechnology courses contain topics covering all aspects of the applied biotechnology industry, such as intellectual property and patents, commercializing technology etc. 3 PEO 3 Contribute towards technological development through academic researchand industrial practices. PSO1: To producegraduatesas an outstanding researchers or eminent scientist in the field of biotechnology and to generate unique products for social need with concern ethical statute. PSO2: To sort the students to be an efficient entrepreneur to twitchbiotechnology companies and industries. 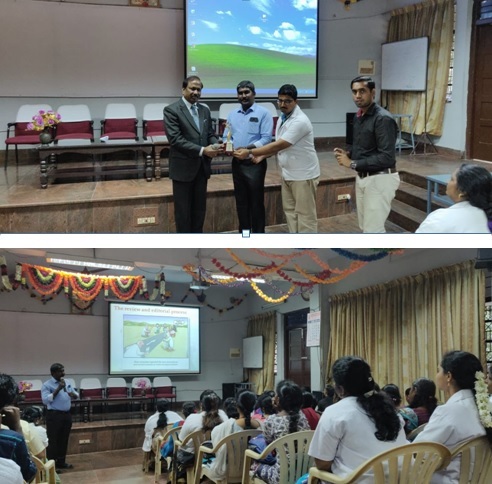 Special Guest Lecture Seminar on “Translation of Research into Publications” by Dr. S. Karthi, N-PDF, Manonmaniam Sundaranar University, Tirunelveli. Awarded as a Invited Speaker conducted by 43rd Annual Conference of Environmental Mutagen Society of India (EMSI) and International Symposium on “Impact of Environmental Mutagenesis in the Human Genome” at VIT, Vellore, India in a broad topic of “Toxicological effects of chemical constituents from piper against the environmental burden dengue vector and their impact on non-target biomonitoring aquatic insects”. Students are benefited with e-learning through free online courses through digital platforms NPTEL & SWAYAM.